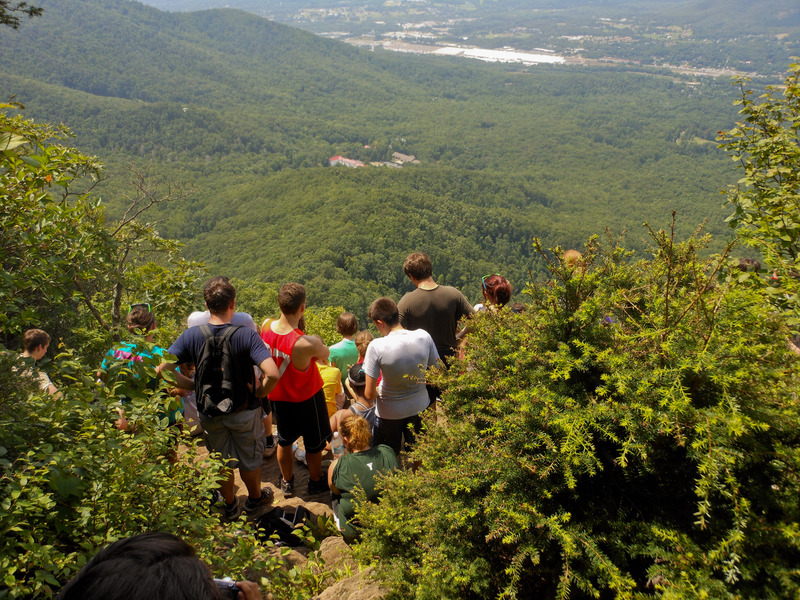 Yesterday afternoon, two groups of advisors and delegates waited behind Lee Hall to begin the hike to the top of Black Mountain. The hike started out easy, but progressively became tougher. Three miles of obstacles all the way up including rocks, branches, mud, and steep slopes stood between hikers and the summit of the mountain. On the way up the mountain on the second hike, the first group was on their way down. As the two groups passed each other, both cheered the other on before proceeding in their respective directions. Everyone was taking pictures, singing songs from the Lion King and Mulan, screaming chants, and doing everything to keep up the morale of straggling hikers. For all appearances, it seemed to be a lovely, peaceful walk up the mountain—until the peace was interrupted. As the second group of hikers headed back down the mountain, two people crashed through the bushes around a bend. It turned out to be Presiding Officers, Athie Livas and Jake Friedler. They came to Lee Hall too late and the group for the hike had already left, so they decided to sprint after the group because they had been on the hike before. They took the wrong trail, which was not well kept and was full of branches, animals, and went to a higher altitude than the other group was going to. Jake kept telling Athie that this was definitely the wrong trail, but they kept going anyway hoping to find the group of hikers. After what seemed like hours, they reached the highest point of the mountain. Upon reaching the top, the pair decided to turn around and search for a group of hikers coming down the mountain. Eventually, Athie and Jake heard delegates at a distance and began to blaze their own trail through the underbrush to meet up with group two. They were so happy to make it out alive and not be lost forever.